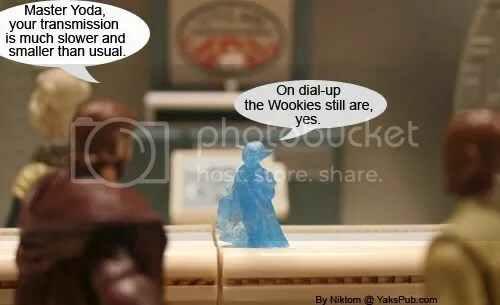 Wookiee dial-up? Huh. I thought the trees just gave a crappy reception. AWESOME! I’m glad Yoda came in handy. I don’t even want to know what the connection is like on Endor. Off topic, which Yoda figure is that? LOL Apparantly my laptop still logs me in as Trooper_1138. Yeah, well I have another question: That sign? What is it from? The Yoda “Figure” is a modified Yoda Hologram Pack-In provided by Brent, thanks again buddy. The sign is actually the base from the WA-7 Dexter’s Diner Droid. Tenike… the connection on Endor was great until those Rebels blew up the shield generator. Those Ewoks were getting free Cable, High Speed Internet, and the best Cell Service in the Galaxy. Now their using Stormtrooper Helmets connected with rope. Dang, why didn’t I shoot this instead… that’s a weeks worth of jokes right there! And about the base, that’s pretty creative!